A health care stock that's starting to trend within range of triggering a near-term breakout trade is RadNet (RDNT - Get Report) , which provides outpatient diagnostic imaging services in the U.S. This stock has been moving strong to the upside over the last six months, with shares sharply higher by 49%. If you take a look at the chart for RadNet, you'll see that this stock has been uptrending a bit for the last few weeks, with shares moving higher from its low of $7.53 to its intraday high on Thursday of $8.40 a share. During that uptrend, shares of RDNT have been making mostly higher lows and higher highs, which is bullish technical price action. That move has now pushed shares of RDNT within range of triggering a near-term breakout trade above some key overhead resistance levels. Traders should now look for long-biased trades in RDNT if it manages to break out above some near-term overhead resistance levels at $8.39 a share to its 50-day moving average off $8.40 a share and then above more resistance at $8.95 a share with high volume. Look for a sustained move or close above those levels with volume hits near or above its three-month average action of 414,792 shares. 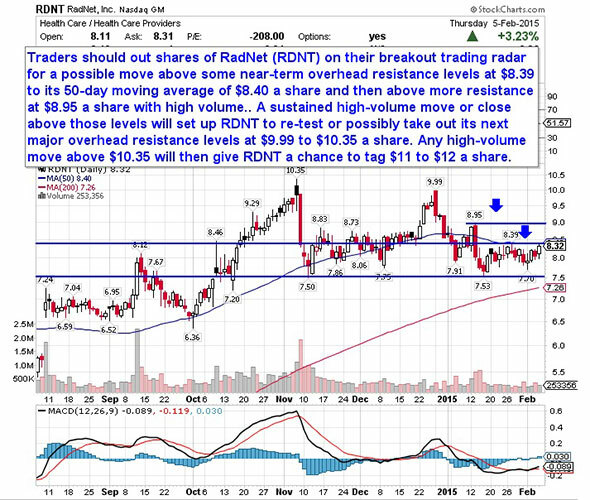 If that breakout develops soon, then RDNT will set up to re-test or possibly take out its next major overhead resistance levels at $9.99 to its 52-week high of $10.35 a share. Any high-volume move above $10.35 will then give RDNT a change to tag $11 to $12 a share. Traders can look to buy RDNT off weakness to anticipate that breakout and simply use a stop that sits right around some key near-term support levels at $7.70 to $7.53 a share or near its 200-day moving average of $7.26 a share. One can also buy RDNT off strength once it starts to take out those breakout levels with volume and then simply use a stop that sits a comfortable percentage from your entry point. A technology stock that's starting to move within range of triggering a major breakout trade is Datawatch (DWCH , which designs, develops, markets and distributes business computer software primarily for the visual data discovery market in the U.S. and internationally. This stock has been slammed by the sellers over the last six months, with shares moving sharply lower by 52%. If you take a glance at the chart for Datawatch, you'll see that this stock recently gapped down sharply lower from almost $8 a share to its new 52-week low of $5.32 a share with heavy downside volume flows. Following that gap, shares of DWCH have started to stabilize and uptrend a bit, with the stock moving higher from $5.32 low to its intraday high on Thursday of $6.10 a share. That move has now pushed shares of DWCH within range of triggering a major breakout trade above some key near-term overhead resistance. 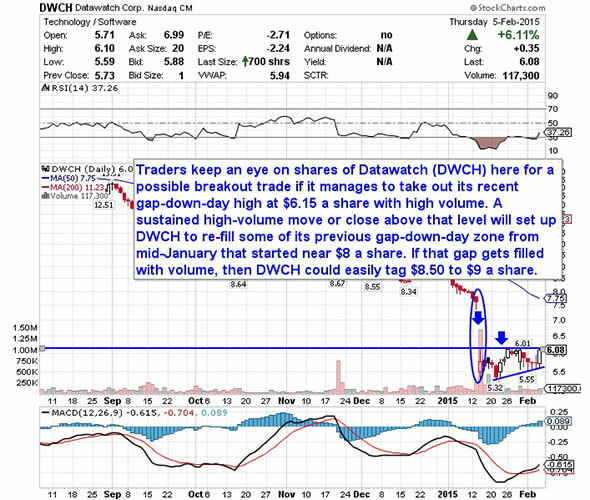 Traders should now look for long-biased trades in DWCH if it manages to break out above its gap-down-day high from mid-January at $6.15 a share with high volume. Look for a sustained move or close above that level with volume that registers near or above its three-month average action of 137,216 shares. If that breakout gets underway soon, then DWCH will set up to re-fill some of its previous gap-down-day zone that started near $8 a share. If that gap gets filled with volume, then DWCH could easily tag $8.50 to $9 a share. Traders can look to buy DWCH off weakness to anticipate that breakout and simply use a stop that sits right around some key near-term support levels at $5.55 to its new 52-week low of $5.32 a share. One could also buy DWCH off strength once it starts to clear those breakout levels with volume and then simply use a stop that sits a comfortable percentage from your entry point. 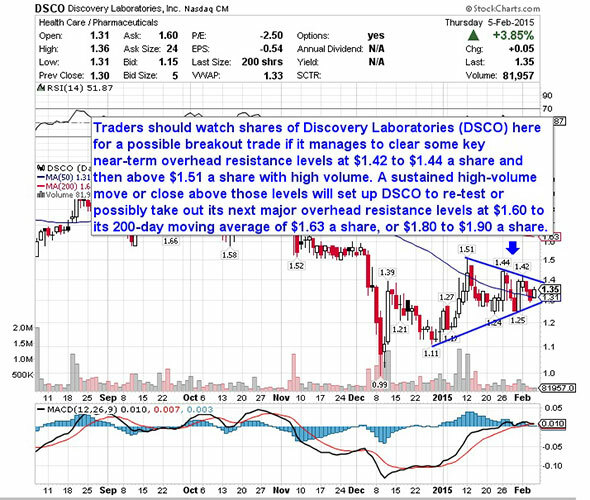 Another specialty biotechnology player that's starting to trend within range of triggering a big breakout trade is Discovery Laboratories (DSCO , which focuses on developing life-saving products for critical-care patients with respiratory disease and care in pulmonary medicine. This stock has been under some selling pressure over the last three months, with shares trading off by 24%. If you take a glance at the chart for Discovery Laboratories, you'll see that this stock has been consolidating and trending sideways over the last month, with shares moving between $1.24 on the downside and $1.51 on the upside. Shares of DSCO have now started to spike higher right off its 50-day moving average of $1.31 a share and it's beginning to move within range of triggering a big breakout trade above the upper-end of its recent sideways trading chart pattern. Traders should now look for long-biased trades in DSCO if it manages to break out above some key near-term overhead resistance levels at $1.42 to $1.44 a share and then above $1.51 a share with high volume. Watch for a sustained move or close above those levels with volume that registers near or above its three-month average action of 355,774 shares. If that breakout materializes soon, then DSCO will set up to re-test or possibly take out its next major overhead resistance levels at $1.60 to its 200-day moving average of $1.63 a share, or even $1.80 to $1.90 a share. Traders can look to buy DSCO off weakness to anticipate that breakout and simply use a stop that sits right below some key near-term support levels at $1.25 to $1.24 a share. One can also buy DSCO off strength once it starts to bust above those breakout levels with volume and then simply use a stop that sits a comfortable percentage from your entry point. Another energy stock that's starting to move within range of triggering a big breakout trade is Triangle Petroleum (TPLM , which is engaged in the acquisition, exploration, development and production of unconventional shale oil and natural gas resources in the Bakken Shale and Three Forks formations in the Williston Basin of North Dakota and Montana. This stock has been hit by the sellers over the last three months, with shares moving to the downside by 20%. If you take a glance at the chart for Triangle Petroleum, you'll notice that this stock has been uptrending strong over the last month, with shares moving higher from its low of $4 to its recent high of $5.85 a share. During that uptrend, shares of TPLM have been consistently making higher lows and higher highs, which is bullish technical price action. That move has now pushed shares of TPLM back above its 50-day moving average of $4.94 a share and it's quickly moving the stock within range of triggering a big breakout trade. Traders should now look for long-biased trades in TPLM if it manages to break out above some near-term overhead resistance levels at $5.82 to $5.85 a share and then above more key resistance at $6.20 a share with high volume. Look for a sustained move or close above those levels with volume that registers near or above its three-month average action of 2.79 million shares. 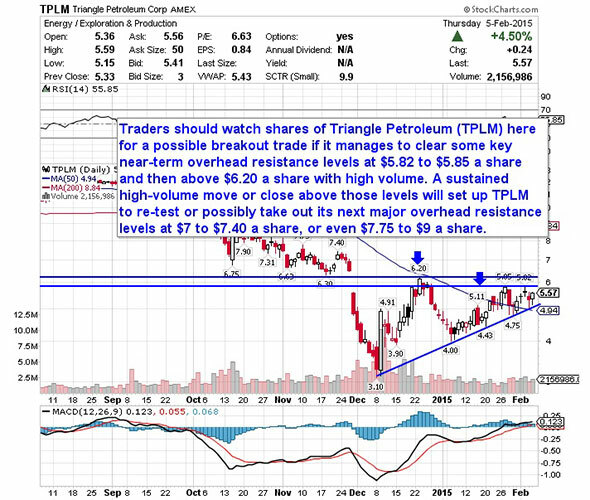 If that breakout develops soon, then TPLM will set up to re-test or possibly take out its next major overhead resistance levels at $7 to $7.40 a share, or even $7.75 to $9 a share. Traders can look to buy TPLM off weakness to anticipate that breakout and simply use a stop that sits right below its 50-day moving average of $4.94 a share or around more near-term support levels at $4.75 to $4.43 a share. One can also buy TPLM off strength once it starts to take out those breakout levels with volume and then simply use a stop that sits a comfortable percentage from your entry point. My final breakout trading prospect is credit services stock Qiwi (QIWI - Get Report) , which operates electronic online payment systems primarily in the Russian Federation, Kazakhstan, Moldova, Belarus, Romania, the U.S. and the United Arab Emirates. This stock has been hammered lower by the bears over the last six months, with shares plunging to the downside by 45%. If you look at the chart for Qiwi plc, you'll notice that this stock recently formed a double bottom chart pattern at $18.52 to $18.70 a share. That bottom is coming after shares of QIWI plunged sharply lower from last September's high of $39.02 to its mid-December low of and its new 52-week low of $18.52 a share. Following that recent double bottom, shares of QIWI have started to rebound higher off that $18.70 low and it's now beginning to trend within range of triggering a major breakout trade above some key near-term overhead resistance levels. Traders should now look for long-biased trades in QIWI if it manages to break out above its 50-day moving average of $22.28 a share and then above more near-term overhead resistance levels at $22.60 to $23.60 a share with high volume. Look for a sustained move or close above those levels with volume that hits near or above its three-month average action of 431,955 shares. 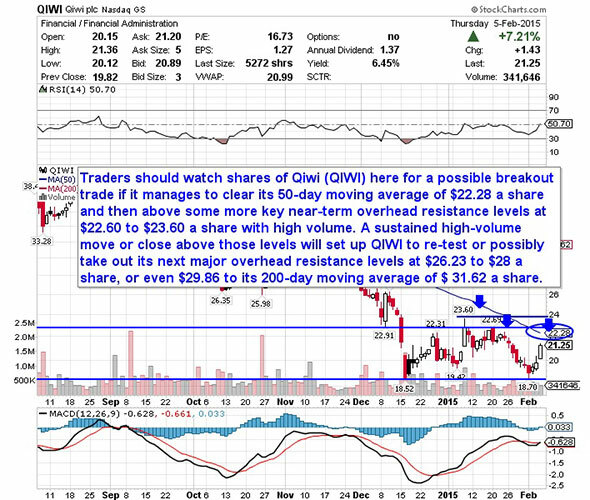 If that breakout kicks off soon, then QIWI will set up to re-test or possibly take out its next major overhead resistance levels at $26.23 to $28 a share, or even $29.86 to its 200-day moving average of $31.62 a share. Traders can look to buy QIWI off weakness to anticipate that breakout and simply use a stop that sits right below some near-term support at $20 a share or near those recent double bottom support levels. One can also buy QIWI off strength once it starts to clear those breakout levels with volume and then simply use a stop that sits a conformable percentage from your entry point. At the time of publication, author had a long position in TWTR call options. Roberto Pedone, based out of Delafield, Wis., is an independent trader who focuses on technical analysis for small- and large-cap stocks, options, futures, commodities and currencies. Roberto studied international business at the Milwaukee School of Engineering, and he spent a year overseas studying business in Lubeck, Germany. His work has appeared on financial outlets including CNBC.com and Forbes.com. You can follow Pedone on Twitter at www.twitter.com/zerosum24 or @zerosum24.